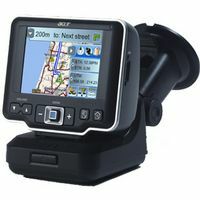 Acer d150 is a portable GPS navigator with 12 Channel Satellite GPS receiver that features CoPilot navigation software, 3.5″ touchscreen TFT LCD display, dynamic route guidance with spoken turn-by-turn directions including automatic route recalculations within seconds of a diversion, travel instructions are delivered with clear voice commands on clear & legible screen images for added safe guidance, using street names and suburbs to determine where to go, detour feature, determine which side of a street the destination is on, safety red light or speed camera warning, and ability to customize to suit travel requirements. TrustedReviews (dead link) reviews Acer d150 Portable Navigator and concludes with rating of 6 out of 10 that “to get you from one location to another the d150 did its job well however, and didn’t let me down during my time with it. However, it lacks the finesse and features of the equivalent TomTom. This wouldn’t be so bad if it was a cheaper option but it’s not. It’s actually more expensive than the TomTom One, which you can pick up at Dixons online now for £240. Oh dear. On this basis I can see no reason to spend more to buy the Acer d150.” Overall, it’s an effective sat navigation device from Acer, but let down by its looks, its interface, its relative lack of features and its price. It does the job, but it fails to present any compelling reason not to buy a TomTom.